Some times little projects are capable of creating a sizeable impact upon their surrounds. Fitzroy-based Adrian Amore Architects are behind a current planning application which intentionally or inadvertently will do precisely that given its incredible form that will juxtapose with its immediate historic surrounds. Currently before City of Melbourne, a planning application for 346 Drummond Street seeks to demolish the current small-scale office complex onsite in favour of a new ultra contemporary, two-storey structure featuring an exposed bent vertical enclosure and canopy. Combining this contemporary architectural expression and a host of ESD initiatives, 346 Drummond Street is certainly a departure from the norm. The concept for this building evolved though looking at the context of this site, and its immediate relationship to the former police building to the south, which is a building of heritage significance, on the heritage register (1878). The siting of the former police station, with its front setback, and flanking driveways, opened opportunities for our design , because it became more than about how to treat a street facade. It was also about the south facade to the driveway which made the site legible in 3-dimensions, which in turn opened the opportunity for the building to become sculptural. The sculptural form of the building, with its bending, twisting webs, which appear contorted and intertwined, can be likened to a bird cage, which has been torn open. The nature of this form of the building is contrasting to the massing of the former police building, which is important to mention, as it is this contrast which highlights the inherent character and individuality of both buildings, standing side by side. Essentially there are two facades or skins to the front and side of the building. The external skin being composed of a webbing of steel, which is to be clad in ochre BROWN coloured Zinc. Between the webs is to be perforated ochre zinc sheet at a lower level which bleeds off as the building gets higher. This skin of webbing rises, bends and twists to become a canopy to the roof garden and travels through the length of the building, bunching, becoming tighter as the building constricts, then running vertically down the rear facade. 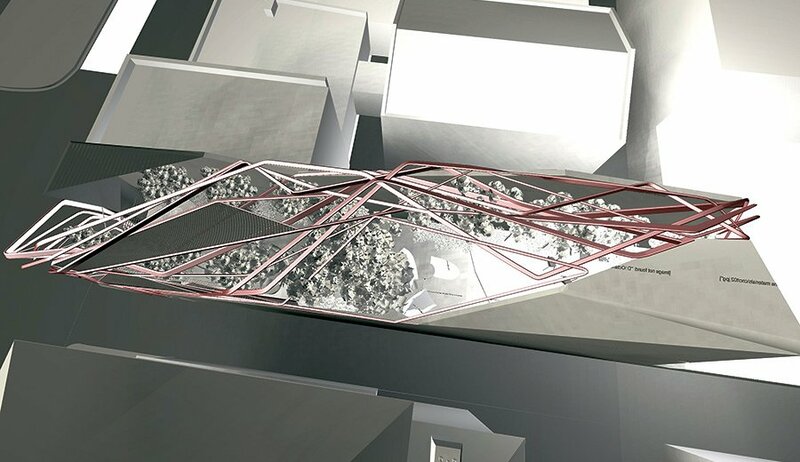 It is intended that the webbing is sculptural, and also that it integrates with the roof garden. With recent extensions to Bombay Sapphire's UK distillery (above left) noted as a point of reference, 346 Drummond Street's exterior will feature a variety of finishes including off form concrete, preweathered zinc which will shroud the frame, perforated charcoal and brown sheet metal elements in addition to glazing glazing. Behind the woven exterior will be a rooftop garden. Described as "Luscious and Utopian", the heavy amount of greenery is expected to eventually cover adjoining walls and spill over and hang from the exterior framework/webbing. This will in turn provide a sharp contrast to the buildings exterior whilst also enhancing amenity for the office space inhabitants. The proposed new building satisfies the expectations of the local heritage policy (Clause 22.05) in terms of its height, scale, and setbacks, however, in a direct application of the policy the unusual form of the building does not strictly comply with the requirement for a more conventional building form in a heritage setting. The sculptural form of the building will present as a visually prominent element, but will not dominate the surrounding streetscape context, nor detract from the former Carlton Police Station, Court House or commercial building (all included on the Victorian Heritage Register). These iconic buildings, and the nearby C and D graded heritage buildings, will continue to contribute to the heritage character of the streetscape, albeit diminished. From small projects such as 346 Drummond Street to Republic Tower, exemplary designs don't come along every day. With tight development budgets generally holding sway, it's not all that often that architects are given what looks to be complete architectural license to design as they please, and even then there's no guarantee that a given design won't be pared-back beyond planning approval. 346 Drummond Street looks to be a project where proponent GMP Nominees (Vic) Pty Ltd has given free reign to Adrian Amore Architects, and the result the outcome couldn't be more interesting. But will the design respect the heritage aesthetic of its surrounds? As evidenced above the answer is generally yes, although it's clear 346 Drummond Street is in sharp contrast to the existing built form of the area. Regardless 346 Drummond Street is such a rare, unique, almost manic design you can't help but want it to be built! This looks aesthetically very interesting, to say the least. In terms of the design itself, where can we see the plans for this one? On the heritage front, I'm not entirely sure why Lovell Chen thinks the heritage streetscape is of "diminished" character. Compared to what? There are hardly any Melbourne streetscapes that present exactly as they did in the 19th century (or whichever period one picks) - This part of Drummond Street is not particularly weak with regard to its heritage, with remarkable examples of 19th century building stock preserved on both sides. Perhaps the greatest incursion here is from the Lygon Court development which demolished the incredible Pram Factory, with its original factory residence upstairs, but otherwise, it's a very impressive streetscape.